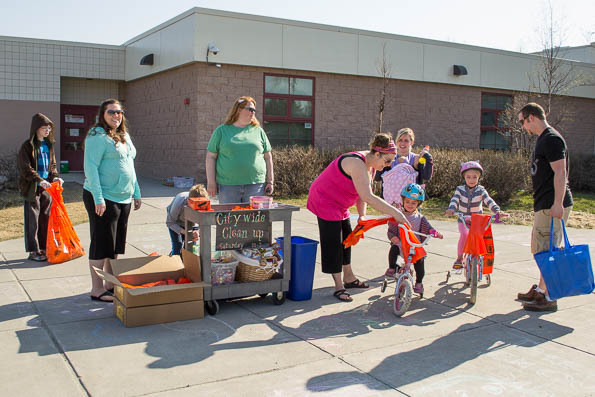 Update: Baxter Elementary School cleans up Muldoon 2014. The snow is melting – and let’s face it, it’s looking trashy around our town. Let’s get our neighborhoods spruced up and looking good! Orange bags for neighborhood cleanup will be available from 10 a.m. – 2 p.m. Saturday, May 3, at Scenic Park Elementary, Baxter Elementary, Begich Middle School and other participating schools. Folks who would like to get a jump on the cleaning can stop by the Scenic Park Elementary school office and get bags from Melissa Parker during school hours. Orange bags are also available from customer service desks at any Fred Meyer store and the Scenic Foothills Community Council meeting May 1. All filled bags must be dropped off at the Scenic Park School, or other participating schools, by 2 p.m. Saturday, May 3rd for free pickup and disposal. Please do not leave bags after the pick up time. Scenic Park students who clean up with their families will get added to the iPod Shuffle drawing to be held on Monday, May 5, 2014. See a gallery of photos from Cleanup Day 2013 on the Schools tab at ilovemuldoon.com. More information on Anchorage Citywide Cleanup on their web site here. Cleanup day for Muldoon Town Square Park (proposed) along Chester Creek on the old Alaska Greenhouse site will be at noon May 17 during Creek Cleanup week May 10-17. Capital Improvement Projects Survey – have your say! Each Spring, community councils must set priorities for next year’s local funding requests for streets, drainage, parks, etc. before May 31. Your input is requested. Please rank the Municipality’s listed items in order of importance and suggest other projects if you think they are more urgently needed. This brief (3-question) Capital Improvement Projects Survey will guide the SFCC board in setting funding priorities for the next fiscal year and beyond. Thank you for your time! The Municipality’s list includes a few projects outside our council’s boundaries. They are using the survey to get input from all the councils regarding support for areawide projects. These are not projects initiated by our community council. Come to the May 1 Scenic Foothills Community Council meeting to learn more about the capital improvement project funding process. The East Anchorage District Plan Public Hearing Draft (PZC Case No. 2014-0064) is now available online. It is scheduled to go before the Planning and Zoning Commission for hearing at 6:30 p.m. Monday, June 2, 2014, in the Assembly Chambers of the Z. J. Loussac Library, 3600 Denali Street. The East Anchorage District Plan (EADP) refines the vision and goals for East Anchorage in the Anchorage 2020 Comprehensive Plan. The document may be downloaded in its entirety or by chapter from this Municipality of Anchorage web site page. Scenic Foothills Community Council will meet first Thursday, May 1, from 7-9 p.m. at Wayland Baptist University, 7801 East 32nd Avenue, Anchorage, AK 99504 (access via Old Muldoon Road off East 36th Avenue). Click here for web site.